This week we’re continuing to work on storage ‘situations’ in our homes. Figure out what your worst spot is and get started sorting. Last week I gave you some ideas for where to start and I hope you were able to get moving on some storage in your home. If you weren’t able to start, use this week to work on your storage. I spent last week going through boxes in the basement that haven’t been touched since we moved in to our house 5 years ago. My kids spent some time in the basement playing basketball and riding bikes and scooters (they had the best time, I probably should have been doing this all winter long). I made a lot of progress on my basement but I’m not completely done. Sorting through memories takes time and I don’t want to hastily get rid of something only to regret it later. If you made it through a box last week or a whole room, give yourself a pat on the back and keep on going this week! Open storage box/shelf/bin and empty completely. Sort quickly into 4 piles – relocate (bring out of storage), keep (keep in storage), toss, donate. Put everything in its place – relocate, keep, toss, or donate. If something is good enough to go back in storage, label it. Use a label maker, masking tape, or an envelope with an index card taped to the outside to write down the items inside the box or bin. So the bins that you see in the picture were my progress from last week. Lots of bins emptied, lots of stuff donated and relocated. It’s okay that my progress isn’t a shelf with super organized bins all color-coordinated. This is what real progress looks like for me. And I love it! 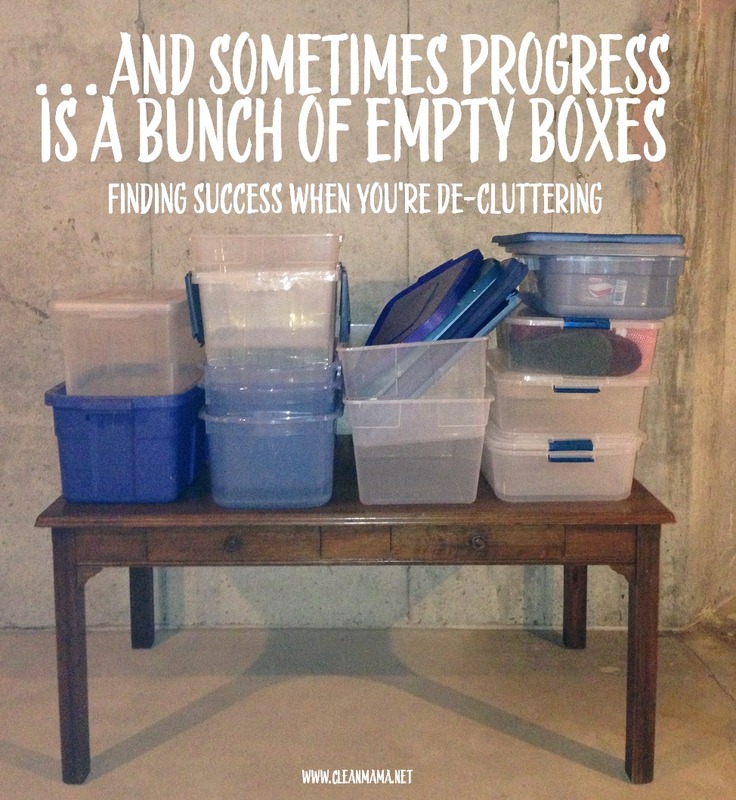 Any success in your de-cluttering this past week? True that~! I am in the process of purging my home of almost 8 years. I will be selling soon and it is a daunting task to get to that point. I’m 62 and disabled so it takes me much longer to do things. It’s been 2 months and I have MANY empty plastic containers which I had been looking at disparagingly. Thank you Becky, for you have turned something that was a negative to me, into a positive!! Got inspired…..started on my basement storage area….3 empty large rubbermaid containers….one bag of clothes to give to a friend with teenage girls….2 bags for goodwill….only took about 1 hour of my time….feels GREAT! Hoping to do my costume box this week….Thanks for all your inspiring ideas CleanMama!!! Yay – so excited for you! My progress this week is a donation bag full of working clothes. I hang on to them, because they are still in good order, but I will definitively stay at home a little bit longer (the kids being 5, 3 and 5months), and when we have something formal to go with my husband’s work obligations, I prefer to put on something else. So I feel really successful, because it took me a while to being able to part with these clothes. Thank you for your encouragement to tackle these jobs!